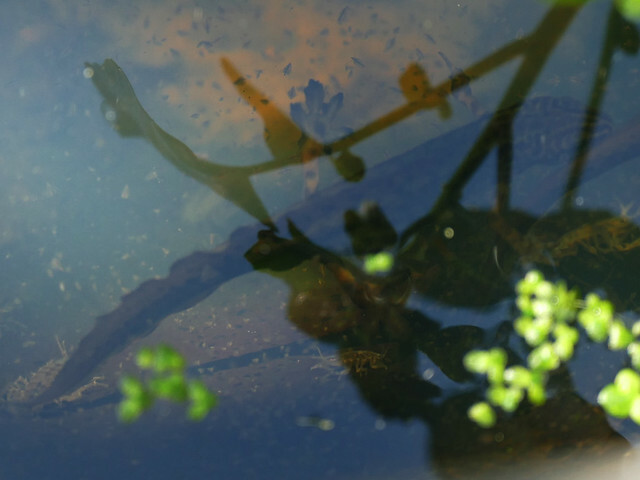 I was only able to get a poor-quality photo of this newt today, (it's several inches under the water here, so difficult to see) and it is different than the others I've been seeing... I was wondering if anyone what sort it is? Its tail has a notched or rippled effect along the top, and it has more distinctive markings, especially around its head... feet are like those on a gecko- broad with splayed-out toes. It's more elusive than the other smooth newts, so I'll have to keep trying to get a better photo of it. Thanks! I was rather hoping it might be a juvenile Great Crested... I keep hoping one of those might turn up.